Beavers and Cubs wear a polo shirt and sweatshirt bearing the Beavers or Cubs logo. 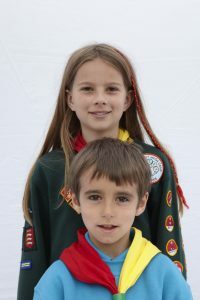 Scouts wear a dark green shirt bearing the Scouts logo. Additional branded items are also available, including baseball caps, trousers and shorts, but these are not essential. All members are given a 1st Bourn necker and a woggle when they are invested into their Section. Beavers, Cubs and Scouts uniform is available to purchase in-store at John Lewis. Alternatively, you can buy it online from the Scout shop. Any badges earned by your child should be sewn on as shown in the files below.